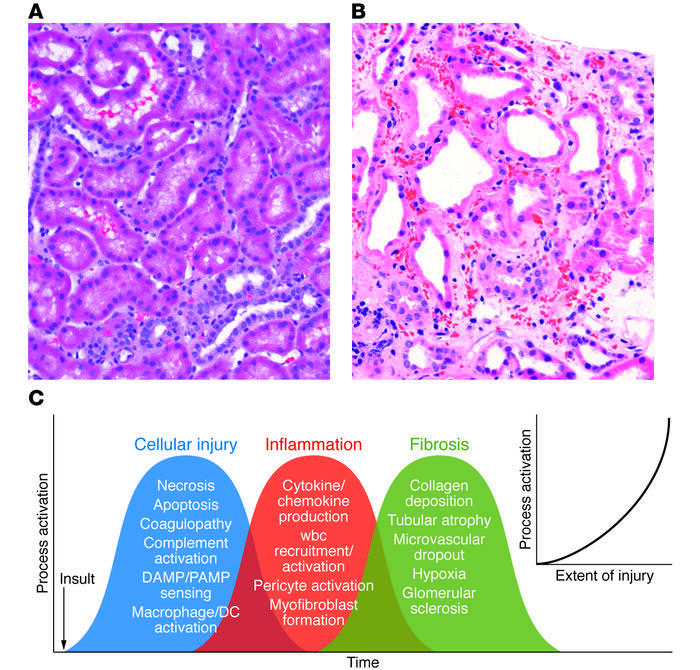 The complex and overlapping nature of AKI. (A) Human kidney biopsy with normal cortical morphology. Note the cuboidal PTCs and closely packed tubules surrounded by microvasculature. (B) Human kidney biopsy with ischemic injury (outer stripe). Note the markedly injured PTCs with loss of the apical microvilli and the large number of wbcs occluding flow within the peritubular capillaries, the rouleaux formation, and the marked expansion of the interstitial space. This area of the kidney is especially prone to ongoing vascular congestion after injury, resulting in lack of reperfusion and continuing cellular injury. (C) Multiple cellular injury processes in resident kidney cells lead to local injury and systemic signals for recruitment of circulating wbcs, including PMNs, monocytes, NKTs, Tregs, NK cells, CD4+, CD8+ T cells, and B cells. These cells magnify the ongoing inflammatory process with enhanced resident cell activation (DCs, pericytes, macrophages), cellular dedifferentiation, myofibroblast formation, and ultimately fibrosis and microvascular dropout. The extent of injury determines the level of process activation (inset).